I’m all trussed up with nowhere to go this fine grey Seattle evening. 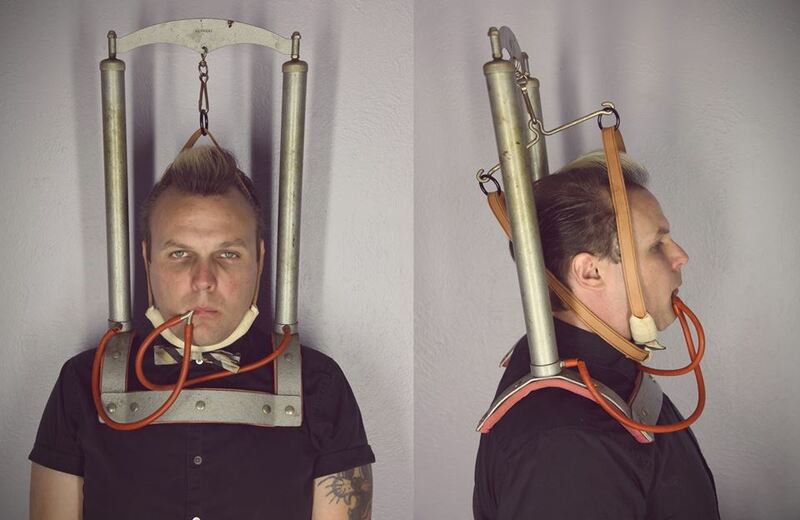 This particular quack device was designed for cervical spine trauma and includes an air piston on each side to be controlled by the patient’s own breathing. A deep exhalation into the mouth tube causes the pistons to rise and thus stretch the neck slightly for some perceived benefit.. Befitting its “Made in Germany” marking, which put it into the pre-WWII era most likely, it is suitable for an evening on the town or a night spent by the fire at home. It looks equally elegant with a hospital gown or tux and tails.